Within the administration of your company, employee data may need to be edited at some point. 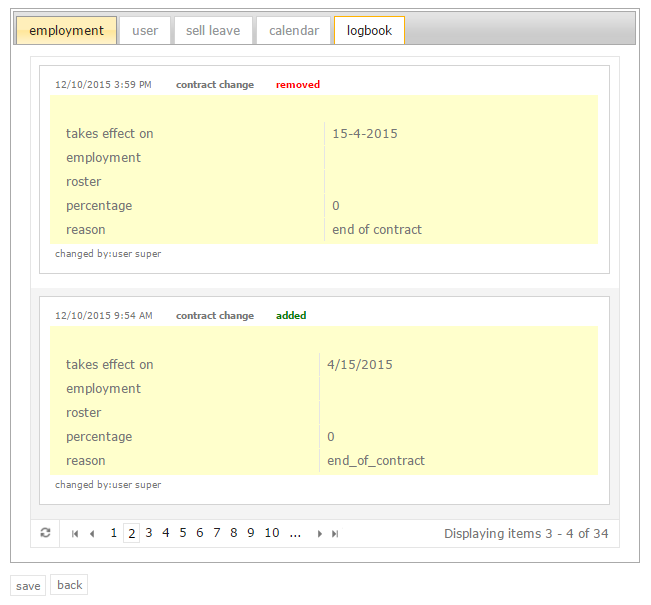 You can edit the employee’s personal information, roles, department, or manager. Status: Here you can see the status of the account. First name: Can be changed if necessary. Surname prefix: Can be changed if necessary. Surname: Can be changed if necessary. Date of birth: Can be changed if necessary. The calculation of senior days is based on this date, so make sure it is the correct one. External number: Here, you can change the employee number, if your company uses those. Function: You can edit the employee’s function here. E-mail: You can edit the employee’s e-mail here. Department: You can change the employee’s department to another one that has been added to the system. Manager: You can change the employee’s manager here. This should be done when a new employee will become a manager, or when the employee has changed departments. Select the drop-down bar to select the desired manager. Only employees with the manager role will be shown in this menu. If this person does not have a manager, he will select his or her own name. He will then take care of his own requests. For other manager options, go to the user or the manager tab. Authorization+ (module): Select the authorization flow that should apply to the request process of this employee. 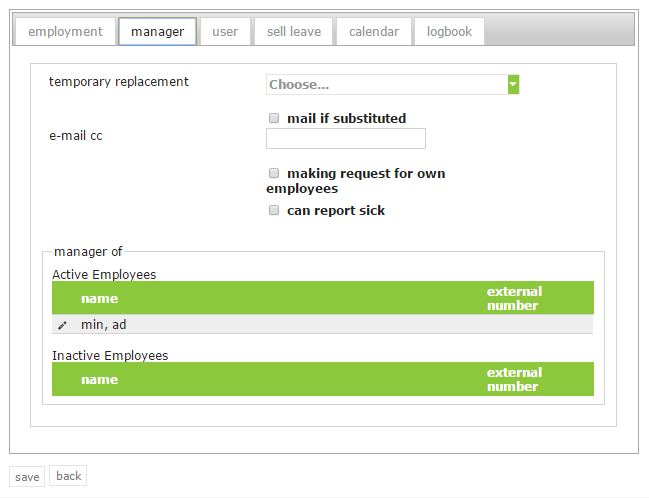 The dropdown menu will contain all authorization flows that are linked to the type of leave ‘all’. Region: Here, you can add an employee to a different region, in case this needs to be changed. 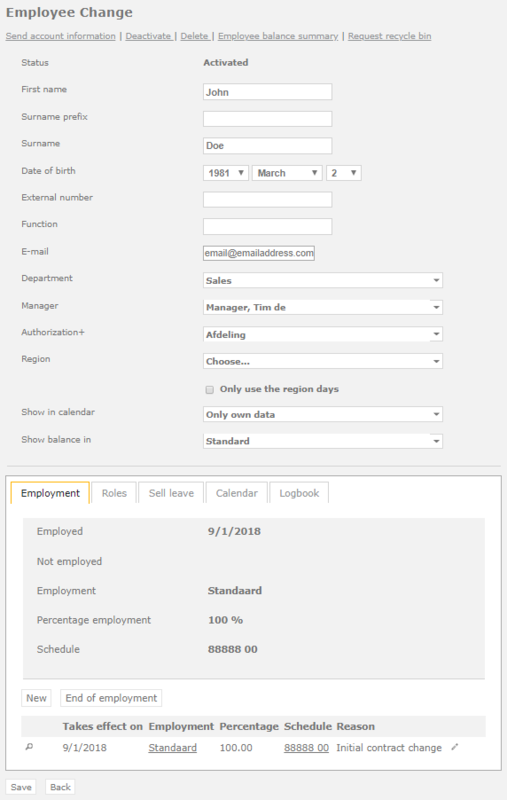 Select the option ‘only use the region days’ if you are not using the standard special days for this employee. If you do want these to count, including the selected region days, leave the box unchecked. Show balance in: The balance can be shown in different ways. When the setting ‘standard’ is used, the settings of the employment will be applied. We advise you to leave it as ‘standard’ so that everyone at the company will work with the same calculations. Don’t forget the click ‘save’ after making any changes, so that the changes can be applied. Here, you can change the employment of the employee. Thus, you can change the amount of leave days the employee will get. So if the employee’s contract changes, implement the changes here. Read more about changing an employee’s contract here. This tab is only visible when you are editing an employee with the manager role. Here you can see that there are some extra options for editing the data regarding employees who are managed by this manager. Temporary replacement: Select another employee with a manager role if it is necessary that the user is replaced temporarily. Immediately after this option is selected, the rights of the current manager will be transferred to the selected manager. This means that the selected manager will assess the requests of the employees of the manager who is replaced. This should be used when a manager is temporarily absent, for instance during a holiday. Read more about appointing a temporary replacement, and what it entails, here. Mail if substituted: When you check this box, the original manager, who has temporarily gotten replaced, will also be notified via e-mail when his/her employees request leave, report sick, etc. This way, the absent manager will still be kept up to date during his/her absence. E-mail cc: Enter the e-mail address of someone who also has to receive e-mails of incoming requests of the employees of the manager in question. Making request for own employees: When you check this box, the manager will be able to request leave for his/her employees. The manager will be able to select certain employees to whom the request will apply when making a request. It is up to you to decide whether the manager will be authorized to do this. Can report sick: When this box is checked, the manager can report his or her employees sick. Read more about sick reports here. Roles: It is possible that an employee will switch roles. In this case, you can change the role(s) here. It is possible to give employees multiple roles. Read more about employee roles here. This tab will only appear when you have the module for selling leave. Select who can sell leave here. The manager is selected as the default option for this. This tab will only appear when you are using the module customized calendar in this administration. Read more about using a customized calendar here. Every contractual change that has occurred will be recorded in a logbook. Thus, it is always possible to see who implemented a change, when this happened, and why. Deleted contract rules will also be recorded here. The image below shows that all contractual changes have been documented.